There are films that are solid entries within a given genre, and then there are films that change a genre. 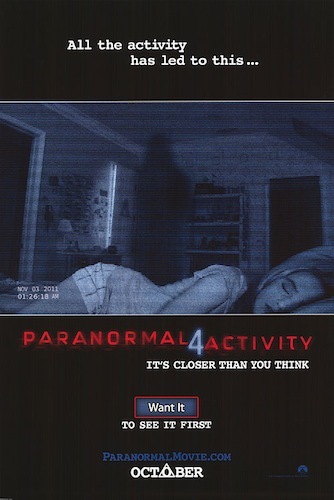 Oren Peli’s “Paranormal Activity” which was originally released in October of 2007 at the Screamfest Film Festival, and received a wide release in October 2009 was one of those movies that changed the landscape of the horror genre forever. The series now has four films, one being released every October. The filmmakers took a really cool approach to marketing this series. Instead of widely releasing the film, they let fans demand it and then would release the film in select theaters. When I found out it was released in Phoenix, and that general area, I had to see it. So, kudos to them for the way they marketed their product. The overall story has a very interesting timeline, in that they are not chronological by any means. In an attempt to not fully confuse the reader who has not seen this series, I will attempt to map out the timeline. The first film is the introduction to the story, the second film is both a prequel and a sequel to the first one, the story completely cradling that of the first film. The third film takes place about twenty years before the first two, and then the fourth film takes place after one and two. Okay, if your head is spinning, I can understand why. In my opinion the story is really well told, and takes an interesting approach to the overall timeline of a story. Let’s take a look at each film and what they entail in terms of the story, and the impact they have had on the horror genre. The story opens in the home of Micah and Katie (boyfriend and girlfriend). Due to recent strange activity within their home, Micah decides he is going to have a camera recording at night in their bedroom, so that they he can then review the film and see for himself what is going on, if anything. He most definitely takes the perspective of skeptic, which really gets to Katie, as she knows that she is experiencing some unexplainable activity. I love the way the film is made because it is all from the perspective of the video camera. This means that sometimes we get some careless shaking of the camera, and aren’t able to always get the angle we want, which dramatically increases the intensity of what the viewer is watching. It also means that we are subject to the emotions of the characters, because we only go where they dare go. Night one of the filming starts on September 18, 2006, and we are given footage through October 11, 2006 during the course of the film. Slowly, we are given evidence from the perspective of the camera, that there are indeed strange happenings in the house. From doors opening and closing to Katie getting up in the middle of the night and standing over Micah for hours at a time, and loud noises coming from outside of the room, it is apparent that Katie isn’t imagining things. Katie decides to hire a psychic to come over and get a read on the vibe of the house, and maybe shed some light on what is happening. After a couple of visits, he tells them that he can’t come any more, because there is a very strange feeling in the house, and he feels unwanted in that space. He refers them to a demonologist, whom they are never able to get in contact with. At one point there is a noise in the attic and Micah goes to take a look. What he finds is a picture of Katie as a little girl. The picture is half burned. Katie hasn’t seen that picture for years, and is completely unsure of why it would all the sudden show up in her attic years later. She is clearly distressed over this finding. Micah becomes increasingly worried. He goes out and borrows a ouija board from someone, against Katie’s wishes. She does not want that influence in their house. They go out on a date, and we are left with the camera turned on in the living room overlooking the ouija board, which pieces begin to move. The board actually catches fire, and their is a design made on the board, that Micah takes a look at later that night. He is confused by what he is looking at. He performs research on the Internet regarding demons, and comes across a woman named Diane Mercer who was haunted by a demon in 1966 and who, through an exorcism actually dies. He shows Katie what he is finding, and is narrowing down options of what may be happening to Katie. Katie becomes increasingly worse, and after her and Micah decide to leave the house because of what is happening, she goes to lay in bed, and says that everything will be all right, and that they should stay. That night, with the camera rolling, Katie leaves the bedroom, and goes downstairs. Micah is awoken by a blood-curdling scream coming from downstairs. Seeing that Katie is gone, he darts down the stairs to find her. All the sudden complete silence falls over the film, and we are left still in the room with the camera rolling. We can see the door open, but only see blackness. Then, very quickly we see Micah come shooting up through the door, mid-air, and is slammed into the wall and killed. Katie had a hold of him, and came flying up the stairs with him, killing her boyfriend. The camera falls to the ground and we are given a ground level angle. Katie is on all fours, and slowly turns and looks at the camera, her face clearly distorted. She then attacks the camera, and the film goes dead. We are informed before the credits that Micah’s body was discovered and that Katie’s whereabouts are unknown. For me, this was the scariest in-theater experience I have ever had in my life. In fact it is the scariest experience I have ever had watching a movie. I didn’t realize how tense I was in the theater until the credits hit. My muscles were sore, and as I stood up, I realized that the flip flops I was wearing were completely covered in sweat. I went home, and was ghost white. I looked at myself in the mirror, and I looked sick. Yes, this film had that impact on me, and that’s kind of fun, in a sick way. I absolutely loved how this movie was filmed, and the intensity of scares that were included. For horror fans, this is an absolute must-see! Aside from “The Shining” which is my favorite horror movie of all time, this is right on top of the pile. Comparatively speaking, you can leave most other horror movies. What is even more great is that this film was made for approximately $15,00o!!! It goes to show that filmmakers absolutely do not need millions of dollars to get across to their viewers. This is the best film in the series, and should not be missed! When the trailer was released for “Paranormal Activity 2”, my insides shook. I was still recovering from the first film, and it took me a little while to even watch the trailer. But when I did, I was instantly pulled in. The first film leaves you uneasy, because we don’t know what happened to Katie. So, my adventurous side came out, and I went and saw this movie with a friend. Yes, I did not dare go alone this time. Also, there were more than five people in the theater this time! As mentioned before, this is both a prequel and a sequel to the first film. Let me explain. This film starts on August 7, 2006, a month before the first one starts, and goes through just past the ending of the first film (October 2006). Here, we are introduced to Kristi, who is Katie’s sister. We follow Kristi and her husband (Daniel) and stepdaughter (Ali). There is also a very important character to the franchise that is introduced at the beginning of this film. Hunter is Kristi’s son (Hunter), whom she is coming home from the hospital with. After their home is “broken into”, and their is furniture turned over, and everything is out of place throughout the house, they decide to install a surveillance system in the house to see what is going on. We also follow Ali are given footage that she is filming. What ensues is some unusual (or paranormal) activity such as was found in the first film. The housekeeper, Martine, and intensely religious individual lets the family know that there is a strange feeling in the house. She brings a rosarie and starts performing some religious blessings on the home, trying to cast out any bad spirits. This is happening against Daniel’s will, so much that he fires her. We see some interactions with Kristi’s family, as well as with Katie and Micah who come over for a poolside barbecue and things of that nature. In this sense, there is good character development in that we get to know them as a family, and develop feelings for their safety. As will be the formula for this and the remaining two entries in this franchise so far, we are given the most important part of the story in the end of the film. As the film draws to its end, Kristi becomes increasingly worse. She confronts Ali when she is trying to pick up a crying Hunter. Ali then contacts Daniel and lets him know what is going on, and that she is worried. Daniel comes home and wants to check on Kristi, but Ali tells him he cannot go upstairs, but that he should look at the footage she has collected. Daniel is fully bought in to what is happening, and calls Martine to come back and perform her religious practices on the house and on Kristi. Daniel tells Ali that they are to not talk about this with Kristi, since she will not remember what happened anyway. Daniel and Ali go to check on Kristi, and she is staring blankly ahead. Daniel nears her and is attacked. They run out of the room leaving Kristi behind. They find Hunter in the basement, and recover him. We then cut ahead. Kristi is not aware of what happened, as was thought would happen. Ali is out of the house, and Daniel is watching TV. All of the sudden, we see Katie behind him in the hallway in her shorts and tank top, all bloody. We know by seeing Katie in this condition, that she has killed Micah and has made her way over to her sister’s house. She comes to Daniel behind the couch, and reaches over and snaps his neck. She then goes upstairs where her sister is taking care of Hunter. Kristi sees Katie, and is extremely worried. Katie rushes her, and throws Kristi against the wall, killing her. Hunter is crying. Katie picks him up, and slowly walks out of the room. We are informed that Katie and Hunter’s whereabouts are unknown. Then the credits roll. I appreciated this entry in the series, all though it didn’t have quite the impact the first one had on me. This was largely due to the fact that I understood a little bit more about how they filmed, and the overall pace of the story. The ending of this film, however, really packed a punch. To see Katie standing in the hallway with an unaware Daniel watching TV was really intense. I didn’t realize she was standing there at first, because she is holding completely still. When I realized she was there, my heart stopped for a few seconds. The question that was begged at the end of this movie was what Hunter has to do with the story. Katie is obviously a key part of the demonic force, as she has been taken over, and used as a vehicle for moving forward what is happening to all of these people. This movie must be watched after the first, but that is part of the beauty of this series, is that each part adds more and more to the previous. I was not the least bit apprehensive about watching the trailer for this film when it was released, because I was now fully engaged in the story, and ready for what was next. The anticipation really grew when the trailer revealed that this film would take us back to the beginning, when it all started. I went to see the film with my good friend (a different friend this time), and we had a good talk about it afterward. Here, we take a big jump back in time. We go to 1988 and follow a young Katie and Kristi as well as their mother Julie, and her live-in boyfriend Dennis who runs a videography business. The film starts with footage from the second film. Daniel and Kristi who are filming the damage done to their home in the beginning of the movie. They uncover some VHS tapes from the 1980’s when taking inventory on what is missing from their home. Then we cut to footage from 1988, and pick up the story of Katie and Kristi’s childhood. Kristi talks to Dennis about her “imaginary friend” named Toby. She describes that she won’t be safe. Dennis is worried about what might be happening, so he sets up some cameras throughout the house that he usually uses for his videography business. He sets up one camera in the kitchen area on top of an oscillating fan, so that the camera can have a wide angle of what it is capturing. We get a lot more of the same slow pace, but the intensity is always there, because something might happen. Dennis and Julie get a babysitter for the girls. She experiences some strange things while she is working on her homework, and when the two arrive back home from their date night, the babysitter quickly leaves. One of Dennis’ work associates, Randy, comes over to watch the girls one day, and while he is watching them, Katie wants to play “Bloody Mary” with him. So they go into the upstairs bathroom and turn off the lights with a camera turned on, and say “Bloody Mary” three times and wait. There is silence, and then all of the sudden Randy yells, and turns on the light. He has been scratched badly on his side, and is breathing heavily. He tells Katie that he is okay. And then there is a loud boom outside in the bedroom. Randy is freaked out but trying to calm down Katie. He opens the door, and furniture is being picked up by an unknown force. He closes the door and opens it again, to find the furniture all overturned. When Dennis returns home, Randy tells him he is leaving and not coming back. Dennis is unsure of what is causing this. Meanwhile, Kristi has been talking to her friend, Toby. At one point, Katie is drug into the toy closet, and the door is slammed shut. As these activities increase, Dennis and Julie decide to leave with the kids and go to Julie’s mom’s house so that they can get away. Here is where everything goes completely bad. In the middle of the night, Dennis hears some strange sounds. He wakes up Julie and they go to see what is happening. We follow Dennis who sees a silhouette through a foggy glass pane in the kitchen area. Dennis moves forward through the house, he moves the camera up toward the stairs. He sees Julie at the top of the stairs, she is hovering in the air, and is thrown down, dead. Dennis is freaking out, and walks to the outside door. He is yelling for the girls, but there is no response. He goes outside, and opens a door to discover a group of women who stare back at him. He runs back in the house, and looks back. The women are moving toward him , all of them with a demonic, glazed-over look. He then discovers Kristi, and they go hide in a closet. There is some very loud booms outside the closet, in the house. Once they come out, they see Katie holding tightly to the stair railing, and kneeling down. Dennis nears her, and as soon as he touches her, she turns around, her face distorted, and a force throws Dennis on his back. Then the girls’ grandma walks in. She stares blankly at Dennis, who, when he tries to get up is thrown back to the ground. Kristi shuffles past the camera, and then Dennis’ spine is snapped, and he is left dead on the floor. Kristi calls for Toby, and then the girls’ grandma takes both girls and tells them “Let’s get ready”. This was another great entry in the series. It did a good job on showing where this whole story is coming from, at least from the perspective of the girls. It leaves an unsettling feeling to see that their grandma, and whatever she is in possession of is willing to let Julie and Dennis die, and take her vulnerable granddaughters into this mess that is obviously, at this point, a cult, due to the fact that there were other women involved, and who were found gathered outside the house. This is again worth seeing, as it is a crucial part in the story. As a fan of the series, the downside is that I know I have to wait another year to find out the next portion of the story, that is now beginning to be broken wide open. All of the other films have led up to this point. I went and saw the latest Paranormal film a couple nights ago (opening night). I knew the questions I wanted answered, but also knew from the previous films that in all likelihood all of those questions would not be answered. Here, we follow Doug and Holly, their daughter Alex (pictured on the movie poster), and their adopted son, Wyatt. They have some strange neighbors that live across the street. There is a boy named Robbie who lives with his mom, whom we find out is Katie. Robbie comes over randomly to the house, and hides out in the treehouse in their backyard. After Katie is hospitalized for an injury, Robbie is welcomed into Doug and Holly’s home to stay for a couple days. What ensues is some strange behavior from Robbie. He is very silent, and shows no emotion on his face. He starts doing weird things with Wyatt, like drawing weird pictures on his back. Ben, who is Alex’s boyfriend, sets up the computers in the household to always be recording through the webcam so they can review the video and see if Robbie is doing some creepy things. Robbie tells Ben at one point that “he” doesn’t like him, meaning Toby, whom Robbie and Wyatt end up communicating with. Wyatt finds out that his name used to be Hunter, or at least Robbie and Toby tell him that. The boys escape over to Robbie’s house while his mom is gone. Alex, who is supposed to be watching the kids, runs over to get them, and runs into Katie. She thanks Alex and her family for watching Robbie, and Alex leaves with Wyatt. Doug and Holly start to see some weird things happening around the house and in the end, Toby ends up killing Doug and Holly, as well as Ben. Wyatt, now known as Hunter (refer back to the second film), is lured over to Robbie and Katie’s house. Alex goes over to get him, and finds Katie there. Alex runs outside, and finds Wyatt outside. She nears him, and then points the light on her camera out over the backyard, and sees a group of at least fifty or sixty women standing there. She turns around, and Katie and all of the other women jump on her like a pack of wolves and kill her. I almost feel like they need to start charging half price for these films, due to the fact that we were fed really a little bit of the story moving forward in this specific part of the series. This was the weak link in the chain of four for me. That being said, it was well worth seeing as a part of the overall series, and now I will wait, and yes, I will be going to see the next movie. This is a very enjoyable series for the horror fan. I have seen a lot of movies, and there is a certain force (maybe it’s Toby) that draws me to this particular series. I will say that the formula they are using is starting to get old, and I do hope that the story is wrapped up in five films. However, even if it went past that point, I will still be watching. Oren Peli really did an amazing job introducing us to this series, and really showing us something we had not seen before. Yes, there are other demonic possession types of films, but not like this. “Paranormal Activity” was revolutionary in the way it presented this type of subject matter. 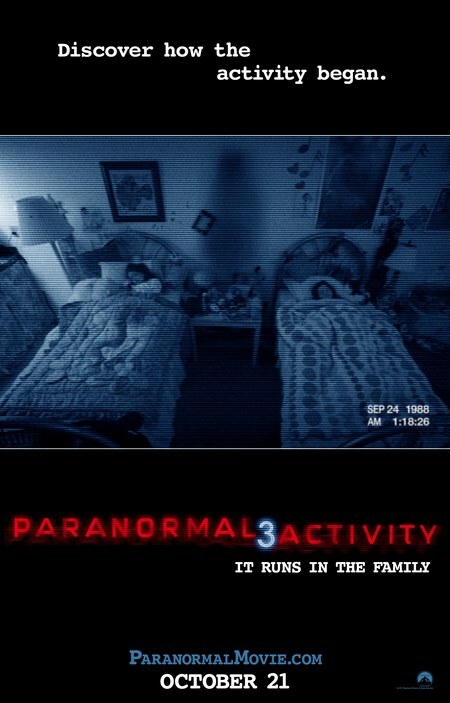 I look forward to the next bit of paranormal activity! What do you get when you mix up a couple of cast members from “The King of Queens”, The Fonz and an underdog boxing story? Well, you actually get a pretty decent movie. 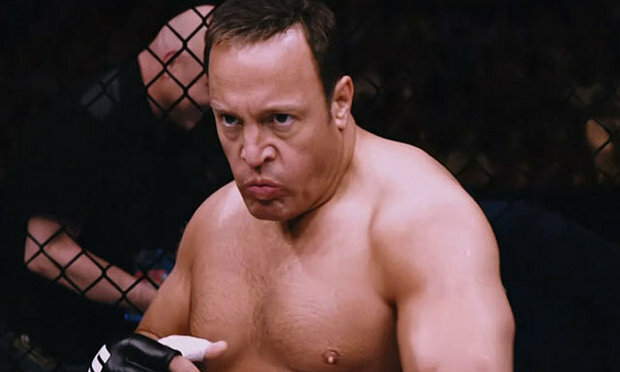 Kevin James heads up the cast in “Here Comes the Boom” which follows Scott Voss (James), a High School Science teacher who stands up for his school when funding is being taken away from the music program. 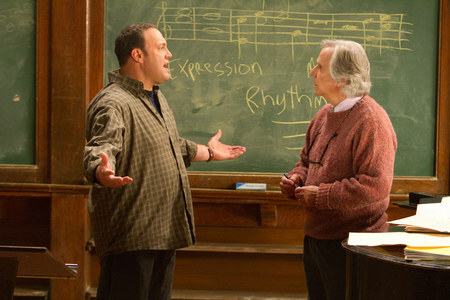 Marty Streb (Winkler), the music teacher is about to lose his job, and acknowledges Scott as his only chance. All options seem further than arms length away, so Scott decides to hail back to his college days as a wrestler, and fight mixed martial arts and take his winnings back to the school. Principal Betcher (Germann) and some student parents are an opposing force, but Bella (Hayek), Scott’s love interest, whom he has to fight just to get a date with, offers support while he undertakes the David and Goliath task at hand. Scott gets a trainer, Niko (Rutten)who Marty teams up with to be the ringside support at the fights. He starts from the bottom and fights his way up to a UFC fight in which he contends against the biggest name in the game. It comes down to that fight for him to get the money needed to save the what he has been literally fighting for. This movie isn’t going to win any awards, and the cast isn’t going to be acknowledged years down the road for their performances here. But all of that aside, this is a fun movie. 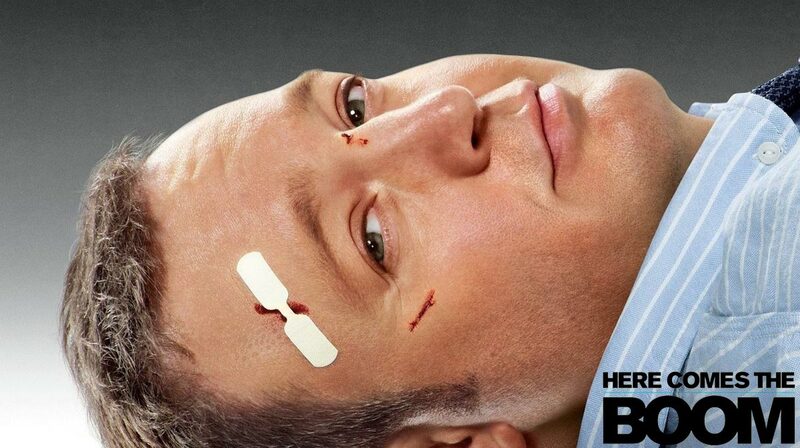 Kevin James continues his role as good-guy. This follows other performances in movies such as “Paul Blart: Mall Cop”, which I found enjoyable as well, and “Zoo Keeper” which was an absolute mess, and hardly worth the $1 and change I paid at Red Box. His long run in “The King of Queens” has been the highlight of his career, and helped him build the name he has in the industry today. Aside from some intense fighting scenes, this is a movie you can take the whole family too. Frank Coraci, who has directed a lot of Adam Sandler flicks took the reins on this one, but with the PG rating from the MPAA, a lot of the language and innuendo that comes with a typical Sandler film won’t be found here. There are a couple of cheesy scenes in the movie that leave you shaking your head, but it’s nothing that takes away from the overall value of a fun film like this. This is worth a fun time at the theater, and most definitely a Red Box rent. Tim Burton creations are most definitely an acquired taste. Once you get past the strange cover of the Tim Burton book, there is quite a fun world of creations to enjoy. I remember watching “The Nightmare Before Christmas” for the first time, in theaters with my family, and not knowing what to think. This was simply due to the fact that I had never seen anything like it before. Now, nearly twenty years after its release, it is one of my favorite films of all time. I have quite a few Nightmare collectibles, and it is a highlight of my trips to Disneyland. 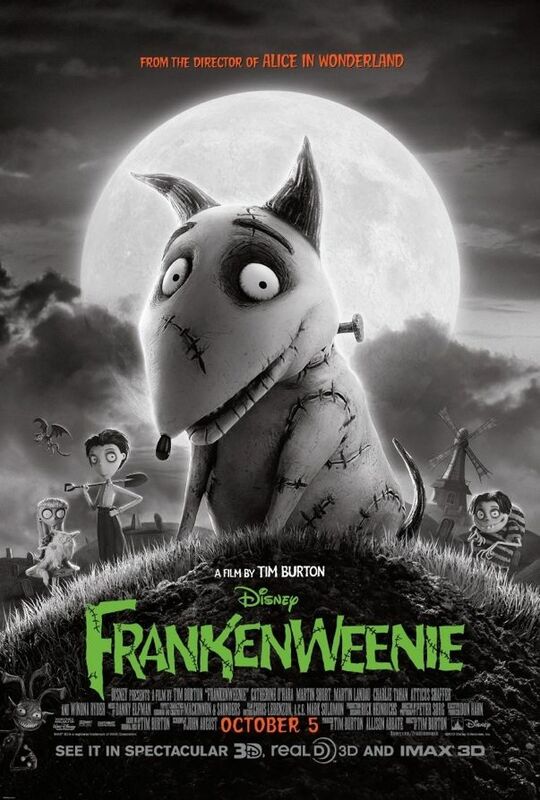 “Frankenweenie” was first introduced to the world in 1984 as a short live-action film starring Barrett Oliver (The Neverending Story), Daniel Stern (Home Alone), and Shelley Duvall (The Shining). Now nearly thirty years later, Burton has brought that story to the silver screen as a feature length stop motion picture. The story follows Victor Frankenstein and his dog, Sparky. But this is no regular “boy and his dog” type of story. Sparky is hit and killed by a car. A dejected Victor decides to bring his dog back to life after viewing a science project at school which introduced electricity to a dead frog, causing its limbs to flap. Victor’s attempts are successful, but has the large task of keeping his dog a secret. Well, that doesn’t last long, as Sparky ventures outside and starts to cause some trouble. Some classmates become jealous of what they think is Victor’s experiment for the school science fair, so they try and bring back some of their own dead pets. What follows is a string of strange events. I found this film to be a lot of fun. The characters, especially Victor and Sparky are very lovable. The mannerisms of Sparky had me laughing a couple times, as did a lot of the dialogue within the film. 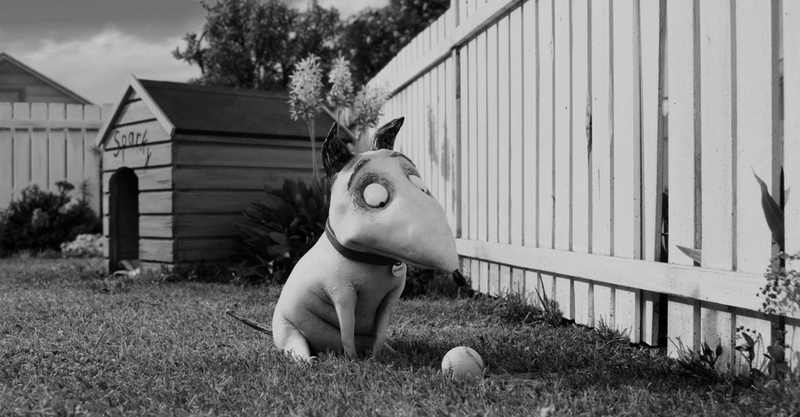 I loved the choice to stay true to the original short film, and create it in black and white. This gives an instant charm to the film, as it has the feel of an old monster movie. 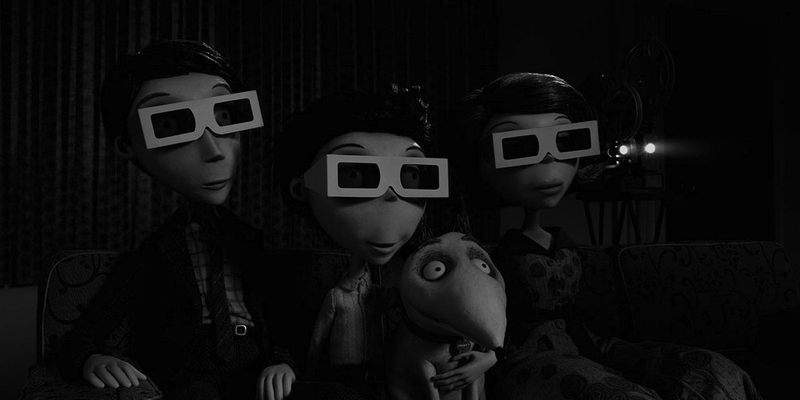 Even during some of the slower parts of the story, I found myself so mesmerized by the amazing stop-motion work by Burton and his team, that it didn’t even matter. For fans of Tim Burton, this is an absolute must-see! Even those new to Burton’s world, this may be a good entry point, as it is consistent with a lot of the styles he follows in his work. I found this an absolute Halloween-time treat, and plan on making my purchase when this is released in stores. Ben Affleck is quickly building one of the more impressive resume’s in the industry. And while he is great on screen, his role as Director has been a force to be reckoned with. “The Town” is one of the best films of the last decade. “Gone Baby Gone“, Affleck’s directorial debut was also impressive. Both films take place in Boston, Affleck’s stomping grounds. That is one aspect I really like about these films. 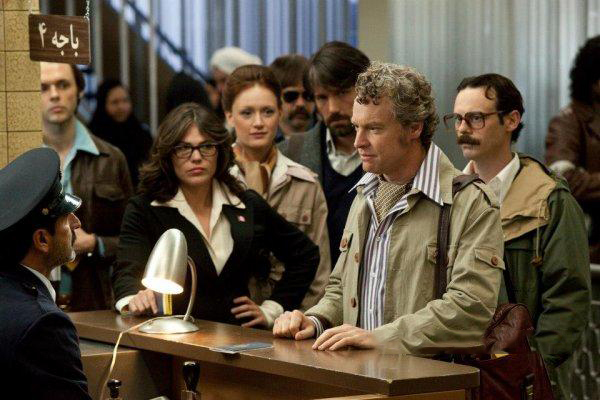 “Argo” adds even more luster to Affleck’s name and his career, but does break outside of Bean Town…way out. The story focuses on the Iranian revolution, which culminates to a point of heavy violence, and hatred toward the American people. Six Americans, under attack, take cover in the home of a Canadian Ambassador, and wait for a chance to make a move. Tony Mendez (Affleck) heads up a CIA operation to go in and rescue the six. His idea is to create a fake movie, and go into Iran acting as if he and his film crew (the six) are scouting locations to film his movie. They plan to remain in Iran for a couple of days and make their way out. But it is not that easy. The film provides great insight into what it might have been like to be in Iran during this horrible time. The film was made to look aged, and even used an earlier version of the Warner logo at the beginning. The filming style also drew a lot of choices from classics like “All the Presidents Men”. Affleck actually cut the film in half, and zoomed in at 200% making the film a lot grainier, adding to the classic feel. While it does have what most might deem a slow plot, I found the film to be incredibly intense, especially in its final scenes. There is a lot to like here, with a wonderful cast. 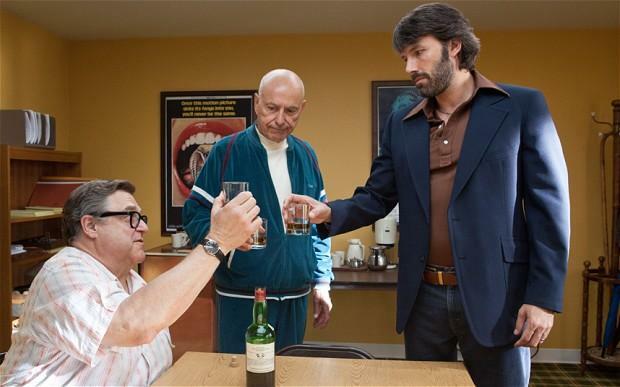 Aside from Affleck, Bryan Cranston (Breaking Bad), Alan Arkin (Get Smart), and John Goodman (The Big Lebowski) provide a great deal of humor and intensity. The six that escape are less known actors but bring a wonderful feel to the production. I appreciated the approach that this film took politically, in that it didn’t take a really heave approach in that direction. It really focused in on the subject at hand, and that was the escape of the six that were trapped there. I was even more surprised for the lack of a political agenda when I learned that George Clooney received a Producer credit. His recent film, “The Ides of March” served up an extra heavy dose of politics, which at times distracted from the overall film, but admittedly, I did enjoy it overall. The rest of 2012 has a few promising looking films. I went into this particular movie with high hopes, as it was coming from a Director that I am gaining more and more respect for, and I was not let down. 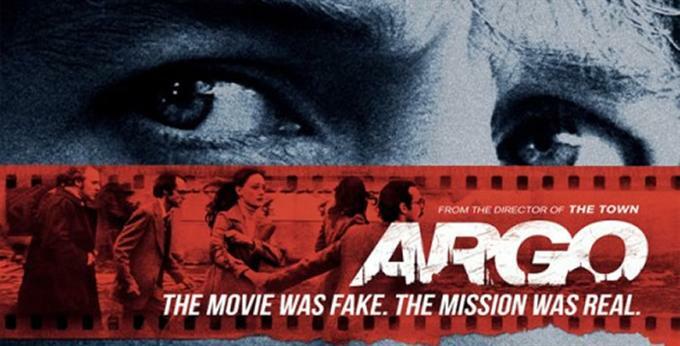 “Argo” provides insight into an important time in history, and details on one of the most daring rescues of all time. I hope to see more from Affleck of this caliber. I was most certainly impressed with his other directorial efforts. Do not hesitate to go and see this film. I have used Apple products for my whole life. I remember my Dad bringing home an Apple II from work, on which my sister and brothers and I would play games for endless hours. Dad would introduce us to something new every once in a while. I remember curling up on the floor outside my Dad’s home office, and falling asleep to the glow of the computer screen. I have always been mesmerized by computers and for the many things I can create using one. The Internet was a huge advancement in the world of technology, and in my young life. I remember searching for what seemed like endless hours for different movie and TV show information, or for pictures of Disney characters that I could draw in my most recent sketchbook. I would later use my computer for documenting my film library when I really started collecting movies. It was a huge advancement for me when I had my first laptop. I felt like I had the world with me wherever I went, and could pull out my computer and do whatever I wanted. Then, years later I got my iPhone and my Kindle. I have had a lifetime love affair with technology, and that love has only grown over time. I have used quite a few laptops in my day. 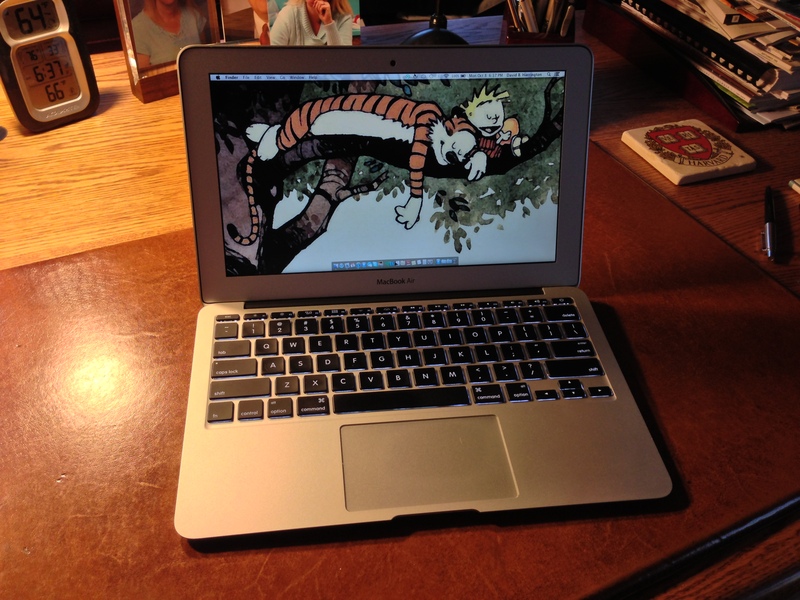 Here I want to focus on my most recent purchase, the 11″ MacBook Air (2012). I have naturally compared it against other Apple laptops I have used (i.e. MacBook Pro, and black and white MacBooks). I have to say right off the bat that this is my favorite of the laptops I have used. Before I continue, I want to outline my overall computer setup. I have a 27″ iMac (my workhorse for video encoding and other longer more strenuous processes). I recently decided I was ready to make my next Apple purchase. 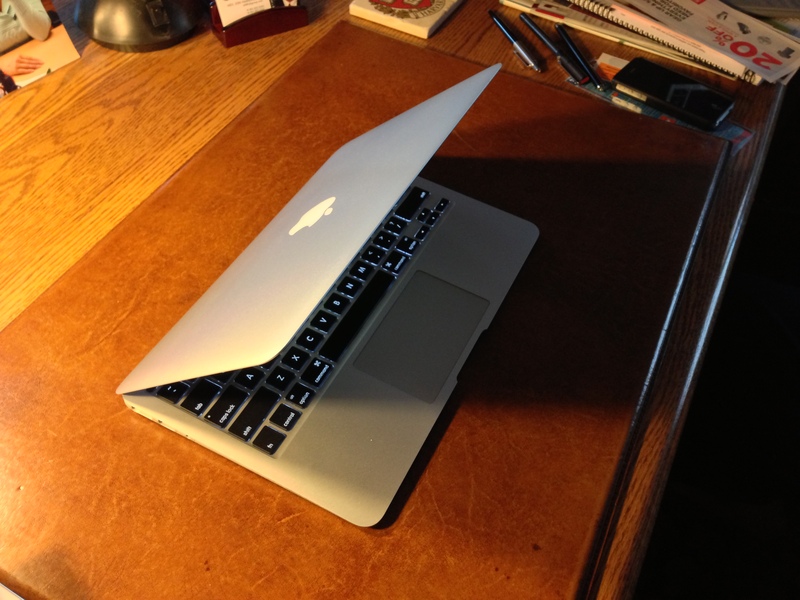 At first, I was set on the 15″ MacBook Pro Retina. After a lot of thinking, I decided it wasn’t something I needed. I was after something that I could blog on, and that I could easily travel with. All signs pointed to the MacBook Air. The decision between the 11″ and 13″ models was an easy one. The smaller of the two models, which I ended up going with is a much better purchase in my opinion. While both MacBook Air models carry with them an extremely thin profile, the 11″ screen is wider, as opposed to more boxy like it’s sister model. I also love the use of space. You still get the full size trackpad, but you don’t have what I feel is unnecessary space to rest your hands. As noted, you will notice the trackpad space being utilized all the way out to almost the edge of the computer. 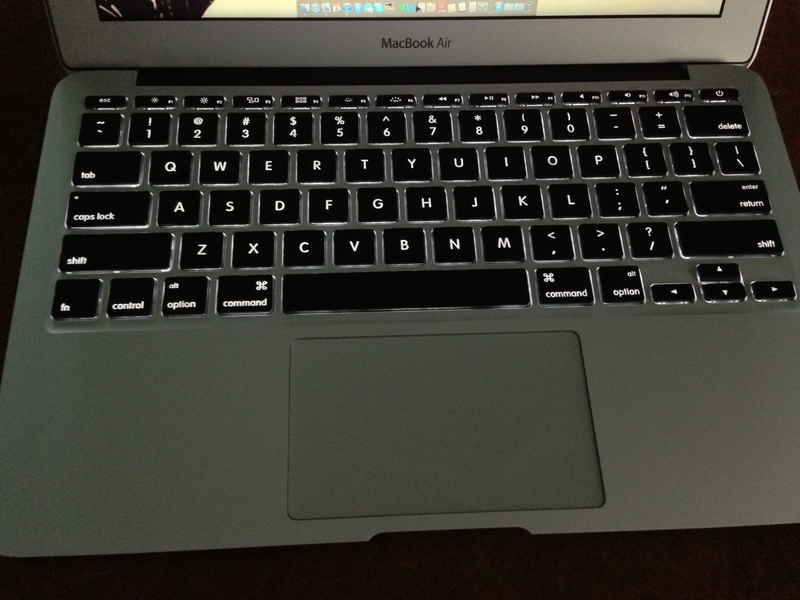 The keyboard keys are slightly more narrow than the other MacBook Air model as well as the MacBook Pro models. But I will say that once you get used to the keyboard, it is extremely comfortable to type on. I am constantly writing and I can do so quickly and efficiently on this model. The chiclet style keys are very nice. A lot more laptops are going to this style as well. The ultrabooks being released in the PC world are using this style as well. 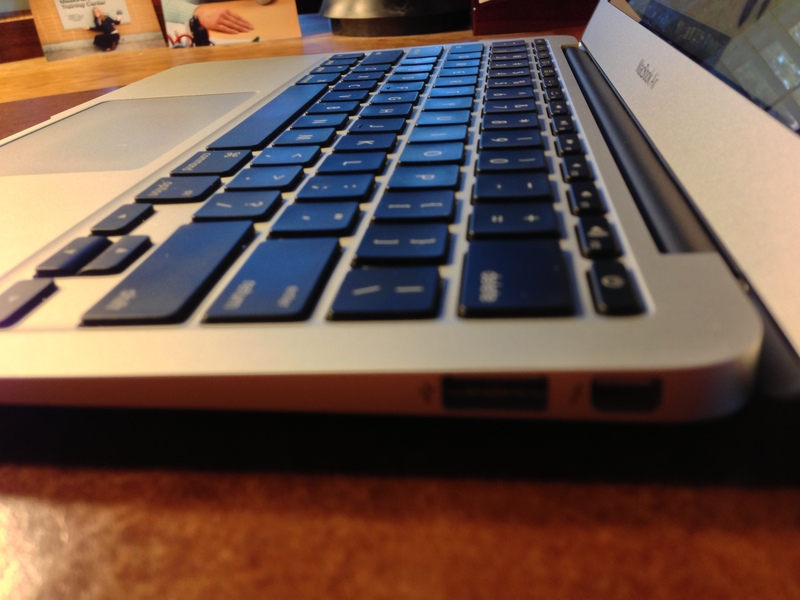 The first MacBook Air models did not use the backlit keyboard feature, however, you will now see that in the current generation as well as the previous generation of MAcBook Air models. The backlit keyboard makes it very nice to type in low-light conditions. I have found many situations in which this has come very much in handy. A lot of times I don’t like an excessive amount of backlight when I am typing on my computer, so it is nice to have the backlit keys. 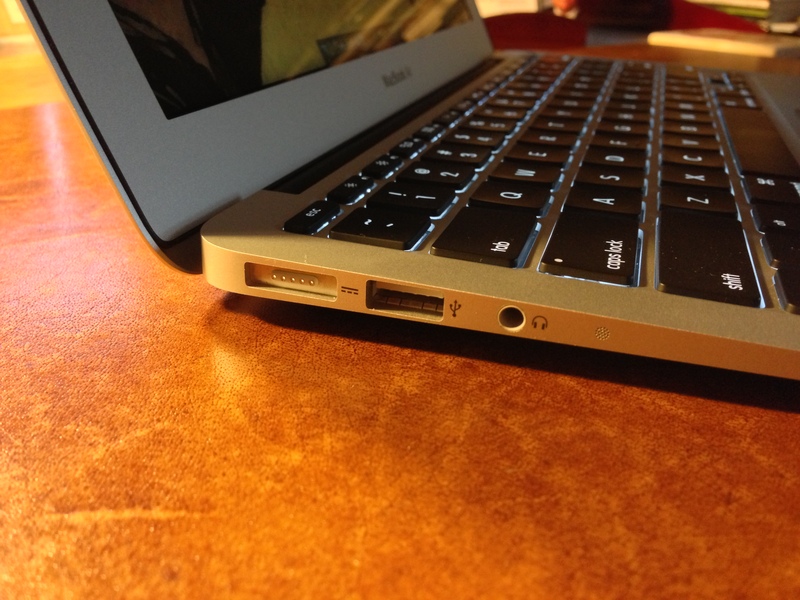 The new MacBook Air models offer an ample amount of ports. The main difference between the 11″ and 13″ models is that the larger model offers an SD card reader, which for me really offers nothing. I don’t remember the last time I used an SD card. But if that is something you would like to have, the 13″ model is the only of the two that offers that. On the left-hand side of both models is the MagSafe 2 port, as well as one USB 3 port, the headphone jack and the microphone. On the right-hand side, you get another USB 3 port as well as the Thunderbolt port. It should be noted that the USB 3 port also accepts USB 2 as well. So if you use some peripherals such as an external drive, you don’t necessarily need a USB 3 drive. I opted for the high-end 11″ model for one main reason, and that is hard drive space. The 11″ model offers both 64GB and 128GB of space. In my opinion, 64GB is not enough space. You’re hurting for space before you even know it. The 128GB drive worked great for me, because I am mostly using mine for writing, and for travel. As I mentioned before, I do have the 27″ iMac which handles my bigger projects. I currently have a 2TB drive in there, which handles all of my video files, music, and pictures. In terms of my music files, I am going to be signing up for iTunes Match which comes highly recommended. The MagSafe 2 adapter is nice. It comes in with a little bit flatter of a design, and of course magnetically latches to the computer. 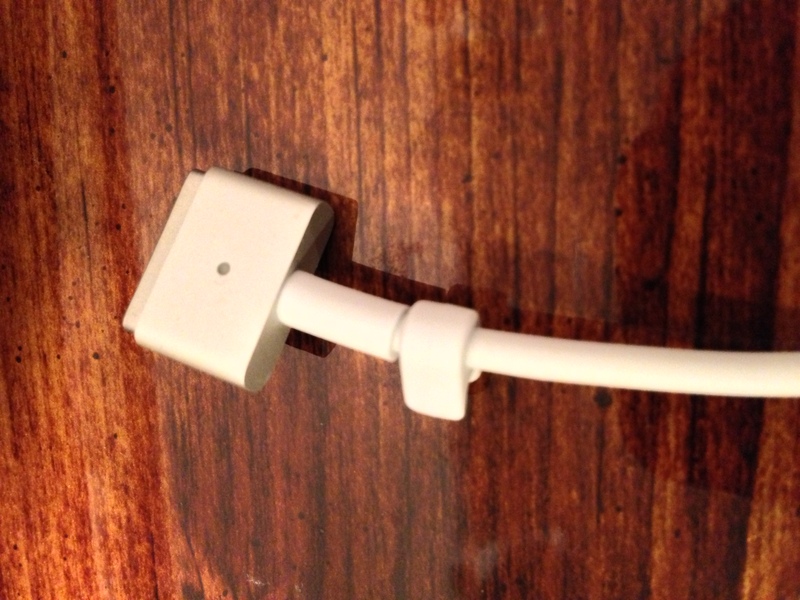 There are some complaints about the design change from the first MagSafe. I personally like the design of the new model, and it looks a little better. I always like to get a good case for my computer. I have always enjoyed the products Incase develops, so I naturally went that direction. This case comes in at a price point of $44.95. 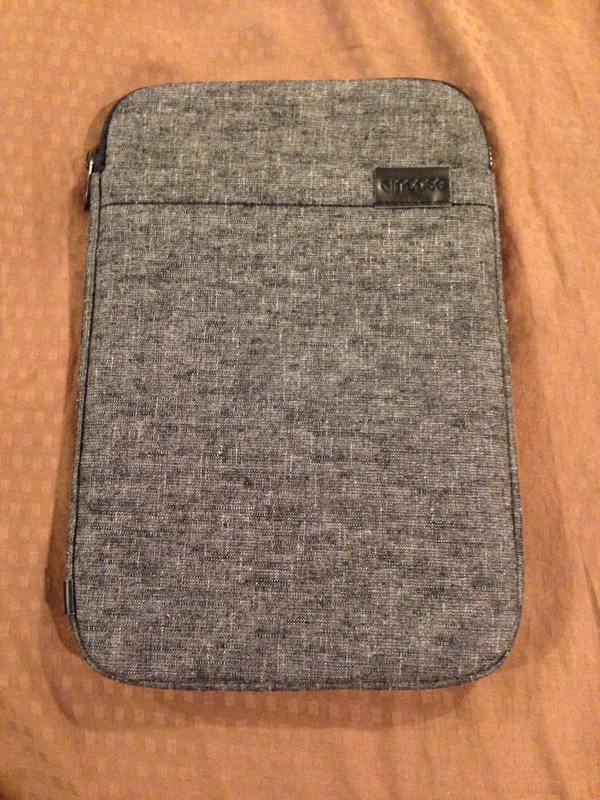 This particular case is the “Terra Sleeve”. 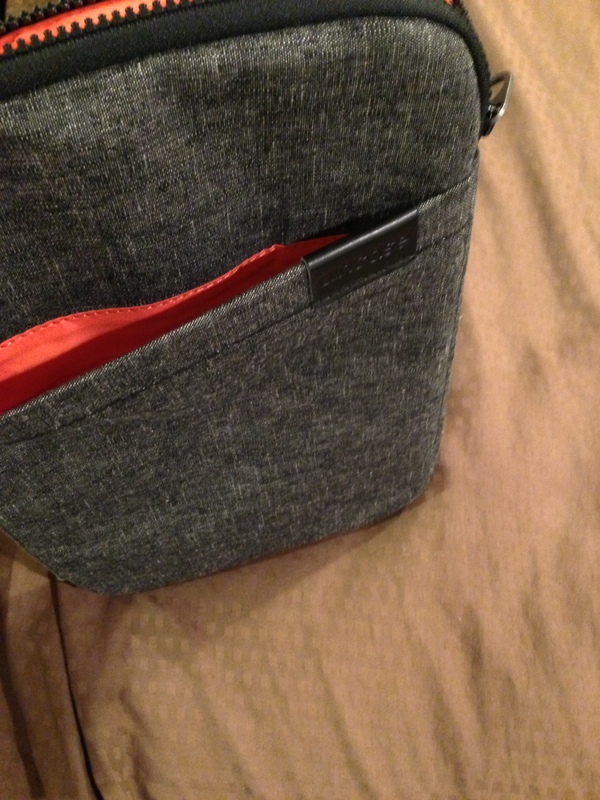 It fits the 11″ MacBook Air perfectly, and I also liked that I can fit my Kindle in the front pocket. 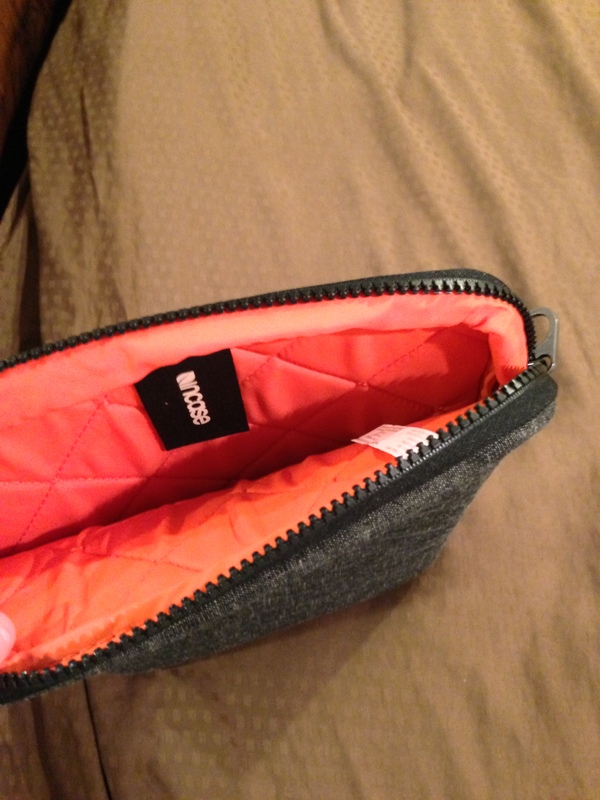 The zipper is sturdy, and the inside provides nice protection for the computer. Of all the sleeves I have seen, this is my favorite. Provides great, comfortable protection on the inside. Offers perfect pocket for a Kindle or other smaller device. I am very happy with my purchase of the 11″ MacBook Air. with the 1.7GHz Intel Core i5 processor, 4GB DDR3 RAM, and 128GB SSD, I have everything I need to do my writing, and traveling. The SSD (solid state drive) makes it a very quick computer to turn on or off, and to access files. If you are coming from a regular 5400 or 7200-rpm drive, this will be a solid upgrade in terms of speed. Also, the computer stays a lot cooler, because of the lack of moving parts. I cannot recommend this computer highly enough. If you are on the fence about the MacBook Air, I would make a conscious note of what you use your computer for. If you already have a desktop, and are looking for a laptop, I would look no further than the MacBook Air.